AXIOM Systems, Inc. (AXIOM) is a privately held information technology services company founded by Healthcare industry experts in 1996. Focused exclusively in the Healthcare market, we deliver a variety of consulting services and products. Our services and products are driven by our extensive knowledge of the “business of healthcare” and a detailed understanding of the regulatory and technology issues that drive business and information technology initiatives. We appreciate your interest in our firm; please take the time to visit this entire site and go to www.axiom-systems.com for more information about our parent company. Visit www.ClaimShuttle.com to learn about SolAce’s sister product for healthcare constituents that are already able to create 837 transactions. Claimshuttle allows secure and managed file transfers to health plans and to CMS, and can help your demystify EDI with easy to use systems and readable reports. Visit AXIOM Products to learn about TransSend, our premier health plan application software that can fully automate all aspects of health plan HIPAA EDI and trading partner management needs. 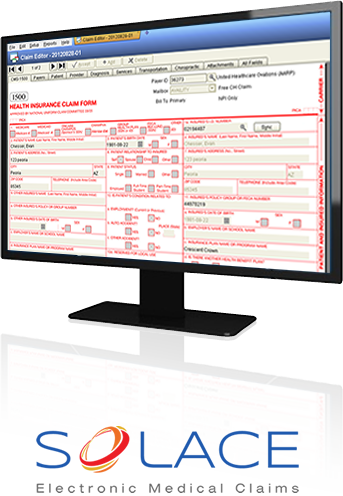 In the early 1990’s Aetna Medicare revolutionized electronic billing by releasing ACE which provided an affordable (and at one time even free) electronic billing solution to thousands of small medical offices at a time when vendors were charging thousands of dollars for similar solutions. ACE allowed these offices to continue using their existing practice management system, and at the same time reduced the handling costs associated with billing a claim by transmitting the claims electronically direct to Medicare. The best feature of ACE was its unique ability to detect common billing errors that would cause the claims to be denied. This detect and correct feature allowed medical offices using ACE to reduce their cash flow window from months to weeks, simply by reducing the amount of rebilling that was necessary to achieve payment. When Aetna Medicare exited the business, Noridian took over the contract but they had already selected a software product called PC-ACE, now called PC-ACE Pro 32. Though PC-ACE Pro 32 is carried by some Medicare carriers, it is not related to either ACE or SolAce. That product originated from a product named PrintLink. The old Clipper/DOS based version of ACE was still being supported and marketed by other small software vendors during the 1996-2000 timeframe but it wasn't compatible with the looming 4010 HIPAA regulation transaction mandates. Recognizing an opportunity to support the thousands of providers that still used ACE, Ivertex developed and introduced SolAce in 2001. In order to provide a seamless migration from ACE to SolAce, the first release provided a simple map upgrade that preserved customers' current settings. SolAce was a completely new product developed in JAVA and not a remake of ACE. At the time, SolAce could be purchased as a standalone single user version running a MYSQL database. or a multiuser version that quickly caught on with sophisticated Billing Services. Connections were expanded to include all Medicaids as well as Medicare and then SolAce quickly became an all payer solution. Many features and functions were added in those early years and a hosted solution (our most popular offering) was soon brought to market. The real claim to fame was and continues to be the ‘detect and fix’ feature that invokes thousands of billing, HIPAA and custom Payer edits that our Clients rely on to ensure clean claim submissions and the simple and automated file delivery and file management capabilities. Meanwhile in 2001 AXIOM Systems developed a successful Payer based HIPAA software application then called HIPAA MAXIM, eventually re-written in a .net framework which is now called TransSend. AXIOM approached the HIPAA challenge from the other side of the house understanding that Payers needed to consume HIPAA transactions, integrate the data streams with back-end claims and administrative systems and generate all of the required HIPAA response transactions. In 2005 AXIOM set out revamp an internally created Claims Creation module but also wanted to evaluate partnership opportunities with best of breed vendors. SolAce quickly rose to the top of the short list and we entered into an OEM relationship with Ivertex. That relationship endured many years due to the strength of the product offering but also due to the trust and respect we had with our partner. In 2011 Ivertex agreed to merge with AXIOM Systems and we are aggressively adding new features and launching new products.